Nexans Euromold products include MV-HV Connectors, Joints & Terminations to connect, splice, repair and maintain medium/high voltage cable and power distribution systems – commonly referred to as cable plugs, Tee’s or elbows the Euromold range of connectors suit all European DIN EN 50180 and American (ANSI) specification bushings. The separable connector (bolted types) connect polymeric insulated cable to MV-HV transformers, switchgear, ring main units, motors or capacitors forming a screened, touch-proof cable termination compatible with gas insulated electrical equipment operating at typical voltage classes of 11kV, 33kV and 66kV. 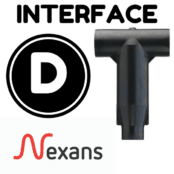 Thorne & Derrick can support the specification and supply of the correct connector – heat shrink, cold shrink and push-on joints and terminations are also available, contact us with your requirements or technical queries. Euromold connectors are premoulded EPDM cable accessories for medium and high voltage cable installations. Meeting international standards to ensure the safe distribution of onshore and offshore electricity supply – Interface C compact screened separable connectors are available for applications where confined space working for the cable connectors, such as 33kV wind turbine switchgear terminations, requires a compacted design of connector. 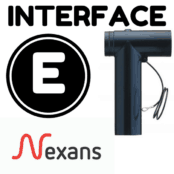 The following Interface C tee connector, compact version, shows the features common to Euromold connector designs – a screenbreak design connector enables the cable outer sheath testing without removing the connectors from switchgear, transformer or electrical equipment. All Euromold connectors are deadbreak connectors – MV HV power has to be switched off before the connector can be disconnected from the interface bushing. 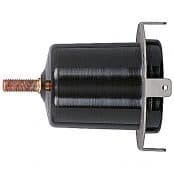 Loadbreak connectors can be pulled from the MV HV electrical equipment with an insulating stick while the cable is still under load or energisation without requirement to isolate the power cables and systems. 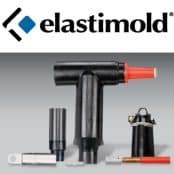 The Euromold connectors are watertight medium/high voltage electrical connections both at the interface bushing of the switchgear or transformer and at the cable entrance. Additional water sealing mastic is applied on the cable sheath jacket for copper wire screen cable installations. Energisation of the connector is immediate after completion of installation in accordance with the manufacturers instructions. 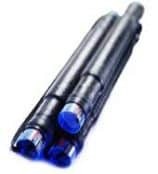 EPDM is an Ethylene Propylene Diene Monomer rubber – the outer jacket and insert of the connector are both semi-conductive while the material in between these two connector layers is insulating EPDM. The separable connectors are manufactured from EPDM providing high mechanical strength which can be easily connected and disconnected from the MV HV bushing for maintenance – silicone cable connectors have a tendency to attach and “stick” to the bushings and cannot be easily removed easily without damaging the actual connector. Euromold connectors are electrically safe for accidental touch due to the 3mm thick semi-conductive layer connected to earth. 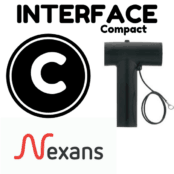 Nexans Euromold connectors include capacitive test points for checking MV HV circuit conditions – the cap of the test point is safe to remove and accidentally touch without protection. The overall available energy is at a minimal level therefore any potential will disappear immediately when touched by the operator. The VD-point has a high impedance and the current transfer is a fraction of a micro ampère and imperceptible to human touch. Intended manipulation during planned maintenance work of the cable connectors should be done with insulating stick, insulated pliers or other appropriate electrical safety equipment. The Euromold cable adaptors are manufactured from compound with a high permittivity factor to provide electrical stress relief at the semicon cut-off point of the cable. Because the cable adaptors are not conductive they provide an effective screenbreak between the MV HV cable and the separable connector housing allowing the cable screen to be tested without disconnecting the connector from the equipment. The IP (Ingress Protection) rating of the Euromold connectors is IP67 – the ccable onnectors are completely dust-tight and suitable for immersion in water of <1m depth. 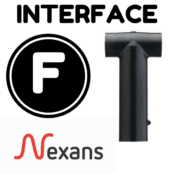 Thorne & Derrick distribute the Nexans Euromold range of cable terminations suitable for single or 3 core cables with polymeric or paper insulation that must be connected or terminated indoors or outdoors at voltage classes 6.6kV, 11kV, 24kV and 33kV – terminations are available in a range of materials and technologies including cold-shrinkable, heat-shrinkable and slip-on kits. 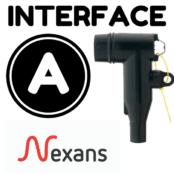 Pictured opposite the Nexans AIN slip-on cable termination manufactured from silicone rubber is cold-applied with integral stress relief for terminating screened polymeric cables with XLPE or EPR insulation up to 33kV/42kV. 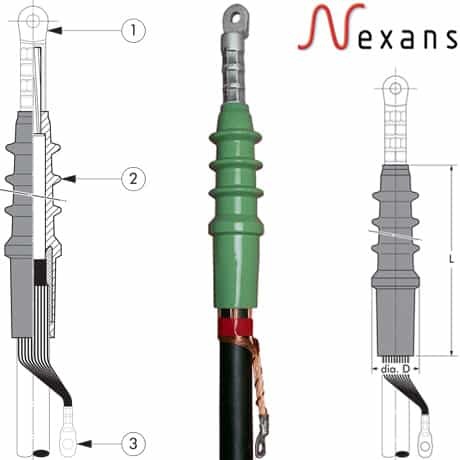 Nexans cable terminations for medium/high voltage power cables are typically used to connect 11kV/33kV cable into cables boxes, switchgear, transformers, substation busbars for overhead lines. Thorne & Derrick provide competitive prices and fast delivery from stock for the complete range of Euromold Connectors for terminating cable into MV-HV gas insulated electrical equipment. 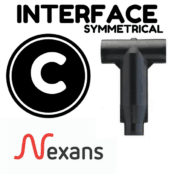 Medium voltage separable connectors premoulded from EPDM rubber and epoxy bushings conform to international standards including CENELEC HD629:1, CENELEC EN 50180, IEC 60137 and IEC 60502-4. 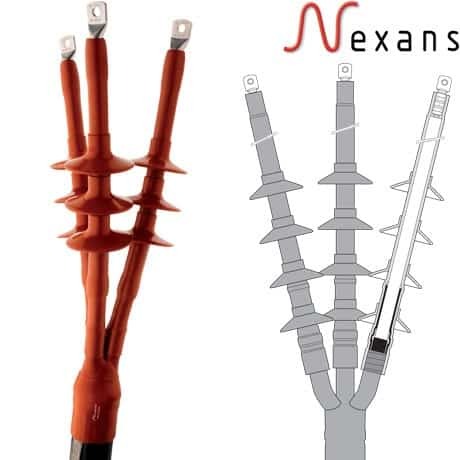 Heat shrink cable terminations are available for medium/high voltage indoor termination of 11kV-33kV cables into air insulated cable boxes or outdoor pole mounted types.